(Excalibur I#62 (fb) - BTS) - Peter (Nigel Orpington-Smythe), leader of the RCX, set out to form a Warpies army to serve the country on his behalf. He used them to construct Cloud Nine an underground base beneath Liverpool's abandoned St. Oswald's Church. With his bases set up, he formed new combat squads like the Seraphim. (Excalibur I#61) - Seeking to bring other superhumans under his control, Peter had the Seraphim kidnap Alistaire Stuart to lure the British superhero team Excalibur into an ambush. Alistaire had just found out the R.C.X. had framed his sister in hopes of weakening W.H.O. and increasing their own power and influence. (Excalibur I#62) - Excalibur members Nightcrawler, Shadowcat and Cerise traced Alistaire to the ruins of St. Oswald's Church, which the Seraphim had anticipated. The leader of the Seraphim, Peanut, surprised the heroes with his presence and then introduced his fellow teammates who emerged from the shadows to attack and defeat Excalibur. Aware he didn't stand a chance against the powerful team of Warpies, Nightcrawler played dead and allowed himself and his teammates to be carried away into the secret hideout underneath the church. After observing the secret base and the Seraphim, Nightcrawler decided it was time to act. Having analyzed the Seraphim and using the small hallway to his advantage, Nightcrawler quickly teleported around them so the Seraphim accidentally took each other out. When Nightcrawler threw Cabbage into Pumice, they both smashed through the doorway to the Serpents holding pen. The Serpents, uncontrollable Warpies with limited intellect and monstrous forms, attacked Nightcrawler while Peanut rolled himself out of harm's way. Nightcrawler would have been killed, if not for Peanut who got help in the form of Peter and his Advocates. Peter then placed Nightcrawler, Shadowcat and Cerise under arrest pending official investigation for being illegal aliens. (Excalibur I#64) - In an attempt to calm down Captain Britain (whom the Cherubim had captured previously) Peter called on some roughhousers Warpies, Cabbage and Pumice were seen amongst them. (Excalibur I#65) - When Captain Britain refused to work for Peter he ordered his roughhousers to beat the hero to death. 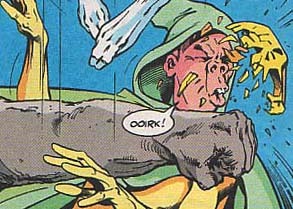 Although Oak and Pumice felt bad about killing the hero they admired so much they still carried out Peter's orders until they believed Captain Britain was dead. Moments later Roma the Omniversal Guardian appeared to restore Captain Britain to his full might. In another part of the Cloud Nine base, Peter's right-hand man Luke ordered all of the Warpie combat forces to attack the remaining Excalibur members and other superhumans who had just been released from their quarantine. Among these Warpies were Cyanide, Peanut and Weasel who attacked the heroes. 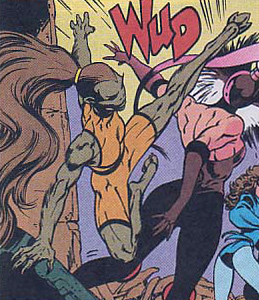 Weasel was defeated early on by Shadowcat while Cyanide fought Cerise. The fight was halted when Captain Britain returned. This led to Peter getting unmasked. In the aftermath, Alistaire Stuart and the former captured R.C.X. agents decided to take over the Warpies' well-being. Comments: Created by Alan Davis (writer, pencils), Mark Farmer (inks). So what does the team's name Seraphim mean? The Bible mentions "Seraph" as one of the celestial beings hovering above God's throne in Isaiah's vision, or a member of the highest order of angels. With that in mind, the Warpies group were the highest order of battle worthy mutates amongst Peter's army. Cabbage was a Warpie that possessed some extended durability. Besides this ability his skin was also bright green. (Excalibur I#61 (fb) - BTS) - Cabbage was one of the many Warpies living at the Cloud Nine facility. As a member of the Seraphim he was considered part of Peter's elite forces. (Excalibur I#61) - Seeking to bring other superhumans under his control, Peter had the Seraphim kidnap Alistaire Stuart to lure the British superhero team Excalibur into an ambush. (Excalibur I#62) - After Excalibur members Nightcrawler, Shadowcat and Cerise walked right into the Seraphim's trap Cabbage and the others attacked the heroes. 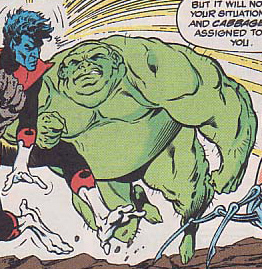 Cabbage and Pumice successfully defeated Nightcrawler, who decided to play dead and allowed himself and his teammates to be carried away into the secret hideout. After observing the secret base and the Seraphim, Nightcrawler decided it was time to act. Having analyzed the Seraphim and using the small hallway to his advantage, Nightcrawler quickly teleported around them so the Seraphim accidentally took each other out. When Nightcrawler threw Cabbage into Pumice, they both smashed through the doorway to the Serpents holding pen. (Excalibur I#65) - When Captain Britain smashed a piece of machinery the hologram of Meggan faded, enraging the hero. Cabbage watched as Pumice and Butane punched the hero down to the floor. But when he refused to surrender, Peter ordered Oak and the other elite Warpies to beat him up. When Captain Britain was beaten seemingly to death, Peter was warned by Tadpole that Excalibur had escaped and a Warpies revolt was taking place. Cabbage and the others quickly made their way to join the big fight. When Captain Britain (who had been restored by Roma) finally defeated Peter who then called out for Butane, Oak and Bison to help him they refused since they realized he had lied to them. With Peter defeated, the former R.C.X. agents Gabriel and Michael vowed to take care of all the Warpies. Cyanide was a Warpie that possessed the ability to paralyze others' voluntary nerve impulses with but a touch. Even though Cyanide wore a costume his powers even penetrated the fabric. (Excalibur I#61 (fb) - BTS) - Cyanide was one of the many Warpies living at the Cloud Nine facility. As a member of the Seraphim he was considered part of Peter's elite forces. (Excalibur I#62) - After Excalibur members Nightcrawler, Shadowcat and Cerise walked right into the Seraphim's trap Cyanide and the others attacked the heroes. Cyanide successfully defeated Shadowcat with but a touch to be knocked out himself by Nightcrawler. 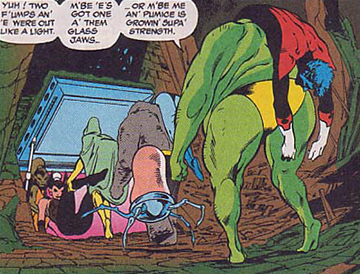 After the heroes had been defeated Nightcrawler decided to play dead and allowed himself and his teammates to be carried away into the secret hideout. After observing the secret base and the Seraphim, Nightcrawler decided it was time to act. Having analyzed the Seraphim and using the small hallway to his advantage, Nightcrawler quickly teleported around them so Cyanide accidentally took out Weasel and was knocked unconsciousness himself by Pumice. When Nightcrawler threw Cabbage into Pumice, they both smashed through the doorway to the Serpents holding pen. (Excalibur I#65) - When Excalibur managed to break free of their imprisonment, Cyanide and several other of Peter's elite teams were summoned by Luke (Peter's right-hand man) to recapture the heroes. Cyanide fought the heroes, but when a large group of Warpies finally took a stand against Peter and his regime an even bigger brawl erupted. Captain Britain (after having been restored by Roma) finally defeated Peter. In his final moments, he called out for Oak, Butane and Bison to help him but they refused since they realized he had lied to them. With Peter defeated, the former R.C.X. agents Gabriel and Michael vowed to take care of all the Warpies. comments: Cyanide also resembled Chlorine of the Sky Pilots perhaps they were brothers. 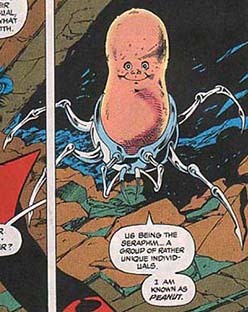 Peanut was a limbless Warpie that used a spider-like robot walker to move, he possessed the ability to disrupt people's concentration, wrecking their coordination and preventing power usage. (Excalibur I#61 (fb) - BTS) - Peanut was one of the many Warpies living at the Cloud Nine facility. As a member of the Seraphim he was considered part of Peter's elite forces. (Excalibur I#62) - After Excalibur members Nightcrawler, Shadowcat and Cerise walked right into the Seraphim's trap Peanut and the others attacked the heroes. As the Seraphim attacked the heroes Peanut watched from the sideline while explaining his fellow teammates' power sets. After the heroes had been defeated Nightcrawler decided to play dead and allowed himself and his teammates to be carried away into the secret hideout. After observing the secret base and the Seraphim, Nightcrawler decided it was time to act. Having analyzed the Seraphim and using the small hallway to his advantage, Nightcrawler quickly teleported around them so they accidentally took each other out. When Nightcrawler threw Cabbage into Pumice, they both smashed through the doorway to the Serpents holding pen. Peanut was saved by Peter and his Advocates. (Excalibur I#65) - When Excalibur managed to break free of their imprisonment, Peanut and several others of Peter's elite teams were summoned by Luke (Peter's right-hand man) to recapture the heroes. Peanut fought the heroes, but when a large group of Warpies finally took a stand against Peter and his regime an even bigger brawl erupted. Captain Britain (after having been restored by Roma) finally defeated Peter. In his final moments, he called out for Oak, Butane and Bison to help him but they refused since they realized he had lied to them. With Peter defeated, the former R.C.X. agents Gabriel and Michael vowed to take care of all the Warpies. Pumice was a Warpie that possessed a hard, sharp rock body. (Excalibur I#62) - After Excalibur members Nightcrawler, Shadowcat and Cerise walked right into the Seraphim's trap Pumice and the others attacked the heroes. 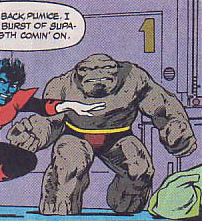 Cabbage and Pumice successfully defeated Nightcrawler, who decided to play dead and allowed himself and his teammates to be carried away into the secret hideout. After observing the secret base and the Seraphim, Nightcrawler decided it was time to act. Having analyzed the Seraphim and using the small hallway to his advantage, Nightcrawler quickly teleported around them so the Seraphim accidentally took each other out. When Nightcrawler threw Cabbage into Pumice, they both smashed through the doorway to the Serpents holding pen. (Excalibur I#65) - When Captain Britain smashed a piece of machinery the hologram of Meggan faded, enraging the hero. Pumice and Butane quickly reacted by punching the hero down to the floor. But when he refused to surrender, Peter ordered Oak and the other elite Warpies to beat him up. When Captain Britain was beaten seemingly to death, Peter was warned by Tadpole that Excalibur had escaped and a Warpies revolt was taking place. Pumice and the others quickly made their way to join the big fight. When Captain Britain (who had been restored by Roma) finally defeated Peter who then called out for Butane, Oak and Bison to help him they refused since they realized he had lied to them. With Peter defeated, the former R.C.X. agents Gabriel and Michael vowed to take care of all the Warpies. Weasel was an agile Warpie with a feral temper, clawed hands and hoofed feet. (Excalibur I#61 (fb) - BTS) - Weasel was one of the many Warpies living at the Cloud Nine facility. As a member of the Seraphim he was considered part of Peter's elite forces. (Excalibur I#62) - After Excalibur members Nightcrawler, Shadowcat and Cerise walked right into the Seraphim's trap Weasel and the others attacked the heroes. Weasel successfully defeated Cerise as she used her powerful legs to kick her in the back and punch her face in the ground. After the heroes had been defeated Nightcrawler decided to play dead and allowed himself and his teammates to be carried away into the secret hideout. After observing the secret base and the Seraphim, Nightcrawler decided it was time to act. Having analyzed the Seraphim and using the small hallway to his advantage, Nightcrawler quickly teleported around them so Cyanide accidentally took out Weasel and was knocked unconsciousness himself by Pumice. When Nightcrawler threw Cabbage into Pumice, they both smashed through the doorway to the Serpents holding pen. (Excalibur I#65) - When Excalibur managed to break free of their imprisonment, Weasel and several other of Peter's elite teams were summoned by Luke (Peter's right-hand man) to recapture the heroes. Weasel fought Shadowcat, but when a large group of Warpies finally took a stand against Peter and his regime an even bigger brawl erupted. Captain Britain (after having been restored by Roma) finally defeated Peter. In his final moments, he called out for Oak, Butane and Bison to help him but they refused since they realized he had lied to them. With Peter defeated, the former R.C.X. agents Gabriel and Michael vowed to take care of all the Warpies.